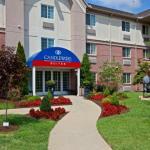 The Candlewood Suites Hotel Louisville Airport, about three and a half kilometers from Standiford Field Airport, is steps away from Louisville Zoo and Louisville Slugger Museum. Convention Center, Kentucky Fair and Expo Center, Churchill Downs, Technology Park and Caesars Indiana Casino are minutes from the hotel. Guests can take advantage of complimentary amenities, such as a parking lot, fitness center with a bike, stair master, treadmill and Universal weights, sports court and barbeque grills. A guest self-laundry facility and safety deposit boxes are another plus. The hotel welcomes your four-legged companions, but the pet should not weigh more than eighty pounds. All suites are appointed with an array of modern amenities for communication, entertainment, a good nights sleep, hygiene, meals and privacy. Guests can make local phone calls free-of-charge in the comfort of room. Enjoy a routine bath rituals in a private bathroom. The business center and public spaces feature high-speed internet. A public computer is available in the business center. Well-lit parking with 125 spaces is open for registered guests only. There are four accessible rooms and parking spaces are earmarked for differently abled guests. The Candlewood Cupboard, a 24-hour convenience store, sells reasonably priced snacks and meals and 50-cents sodas, but the hotel does not have a full-service restaurant. Pets: Yes, pets are allowed. The hotel charges a nonrefundable fee of up to USD 75.00.